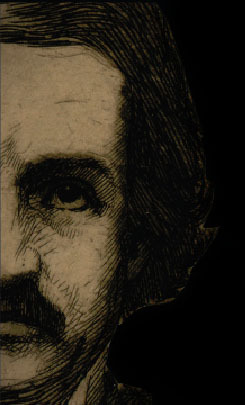 DARKNESS, ANXIETY, AND OBSESSION are the stuff of Poe's works--and also of his endlessly fascinating life. this exhibition sheds light on his biography and mysterious death. The child of stage actors, Poe was orphaned at an early age. he briefly attended the University of Virginia and West Point before achieving his first successes as a poet and writer of short stories. For the rest of his life, Poe made his living as a writer and editor but was constantly in debt and plagued by personal tragedy and literary scandal. at times, he seemed to will his own destruction with his famously quarrelsome behavior and excessive drinking. his wanderings took him from one city on the East coast to another. he endured the death of his young wife before dying under mysterious circumstances in Baltimore at the age of forty.